Do you or that special princess in your life have a lots of headbands? 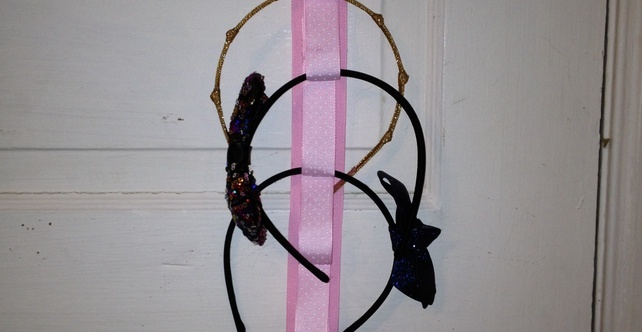 You can create this super cute Headband Holder to keep all your headbands in one place. Check out the Tutorial below created using Snapguide. Check out How to Make a Headband Holder by Wee Bit Trendy on Snapguide. Niesha Kennedy-Robinson is a lover of things handmade. Besides being a wife and a mother, she is the owner and operator of Wee Bit Trendy, a small online shop that provides Handmade Faux Treats for Baby. She loves DIY (why buy when you can DIY), and doing PR for Sharp with Art Group and West Park Arts Festival. Handmade Philly: This Saturday at Philly Swap! As mentioned a few weeks back, some of the folks from Handmade Philly will be holding workshops at Philly Swap this weekend. We will be leading a workshop on how to Make Fabric Necklaces from T-Shirts and we will be leading another workshop on Printmaking/ Stenciling. Philly Swap will be held at the Broad Street Ministry on Saturday, May 12 from noon to 5 pm. This will be Handmade Philly’s 4th year leading a workshop at this event. So come on out, and don’t forget to bring those clothes you no longer want! Whether you leave with a sack full of goodies, or just one or two special treasures, you’re also bound to leave having gained some new insight on reusing clothes and textiles. So, what is Philly Swap? It’s a huge clothing swap complete with sewing machines and workshops, so that you can embellish and re-create all those fabulous finds. Here’s the back story: In 2005, the Swap-O-Rama-Rama was created as an event to offer alternatives to consumerism. Its creator and founder, Wendy Tremayne, saw an opportunity to showcase the creative talents of local artists and DIY specialists through recycling clothing and textiles while addressing consumerism head on. Since then Swap-O-Rama-Rama has reached an international level with clothing swaps happening in cities like Istanbul, Jerusalem, Panama City, and hundreds of others. Through the sponsorship from the New York Foundation of the Arts the program obtained its status as a 501.3C giving it a non-profit status. A Creative Commons License protects the Swap-O-Rama-Rama while allowing the event to continue to be affordable and open to the public. For three years (2008-2010) the Philadelphia Sewing Collective held the Philly Swap here in Philadelphia. New producers have now stepped forward to relaunch the Philly Swap in Spring of 2012. Photo Recap: Fish Puppet Mania Workshop at Shadfest! Shad Fish has been a part of Philadelphia’s history for over 200 years. To celebrate the annual shad run, Handmade Philly provided a workshop for families in which fish puppets were made from envelopes and foam. Both forms were well received, and the children had a blast! Thanks to all of those who came out and supported our first and most likely not last attempt to provide this fun filled activity! Tonight our Handmade Philly Etsy team hosted an ornament making workshop at the Chestnut Street West Elm store. The store provided a lovely spread, and local Etsy artisans shared their wares. Our team worked on a paper ornament craft from an Etsy pattern. We decorated a tree for the Bethesda Project, a nonprofit that serves the chronically homeless. The event had a tremendous turnout, and it was so exciting to see each ornament form, knowing that the tree would be so much more beautiful with each addition. We hope that the folks at the Bethesda Project love it as much as we do. For ways to help the Bethesda Project, click here. Thank you again to West Elm and to Etsy for such a meaningful event! Many of my posts have covered elements of design: timelessness, uniqueness, and simplicity. Last month I featured Sultana Maria Jewelry, whose designs exemplify the element of uniqueness. A new addition to my posts will feature design blogs and websites. I will curate the most fun, educational, and inspiring sites for your reading and viewing pleasure. My first pick is Design Sponge. This website has so many tasty slices of design pie, which makes the whole pie a gourmet delight. So much good stuff is packed into this site that it’s easy to let the time slip by as you browse. Design Sponge is best known for its DIY projects and videos, as well as its before and after design makeovers. Want to know how to do faux French windows? Pattern fan blades? 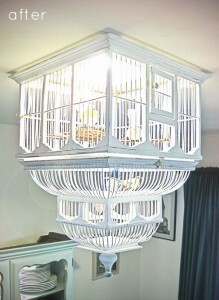 What about turning a birdcage into a chandelier? For a variety of design columns, from recipes, DIY projects, mixing drinks, entertaining, and much more, Design Sponge has it all. Biz Ladies is a section on the site with business advice for women. If you are an artist and want to learn how to market your work, sell, and grow your business, then you need to be checking out this section everyday. If you need some creative inspiration when you are entertaining, Design Sponge is where it’s at. Whether you want to decorate a room, plan a party or mix a drink you can come to Design Sponge and soak up its creativity for all your design projects. Does your camera have a manual setting? Do you know how to use the manual setting? If not, here is a little advice. Using the manual settings can change the look of a photograph dramatically. 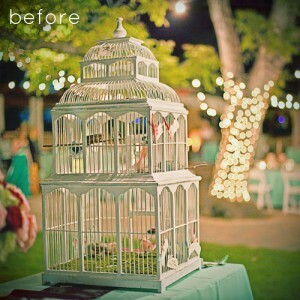 Below I describe how changing your aperture can change the look of your photographs. Depending on your camera and lens your f-stops (aperture) will vary, but below is the norm. By changing the F-stops on the camera you can focus on one small part of the photograph or have the entire scene in focus. 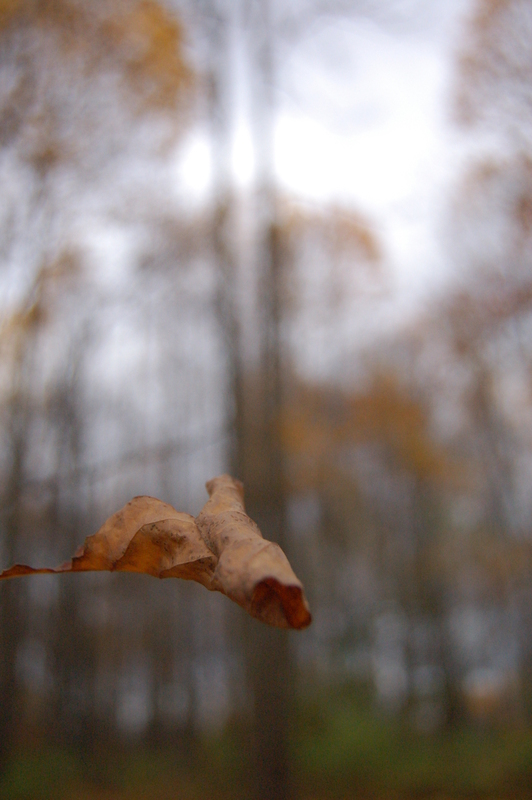 In order to focus on one small item open the aperture all the way. My camera’s largest aperture is f-stop 4.5. I love using the wide open aperture because it really shows a focus on one item. This is great if you are pinpointing one small item. Close the aperture down a bit more and it is great for portraits. If you keep the aperture wide open and take a portrait photo you may focus on the nose, but the eyes could be out of focus. I like to do under 8.0 for portraits because it will soft focus the background. If you are taking scenic photos then usually it is better to go with a smaller aperture, an 8.0 or higher f-stop setting. Of course, the ambient light is also a factor. Use the smaller apertures if you want your entire photograph in focus, but you need to make sure the shutter speed lets in enough light. Most cameras come with an in camera light meter and this will help you to make sure you get the correct speed of the shutter. I program in the aperture size I want and then aiming towards my subject I use the light meter to get my shutter speed correct. You may need to make adjustments to the aperture if you don’t have enough light. Keep in mind if you are hand holding your camera try to stay at a shutter speed no slower than 1/125 of a second. If you go longer than that you may get camera shake unless you use a tripod. I know it is a bit of a technical subject, so go out and experiment. Now that digital cameras are so prevalent you can see what you get as soon as you take it. If you have any questions please contact me and I will try to help. While out shopping in Manayunk recently, I saw a lovely window display of yarn and wire hearts in the window of Green Street Consignment Shop. I thought those hearts would look pretty in my windows too so I set out to make my own. With yarn from Hardy Supply Co, pipe cleaners, and a wire clothing hanger, I did just that. Directions and photographs are below. 1. Start by prying apart the wire hanger. Do not use your bare hands as you will probably cut yourself. Use needle nose pliers for a good grip as well as some gloves to protect your skin. 2. 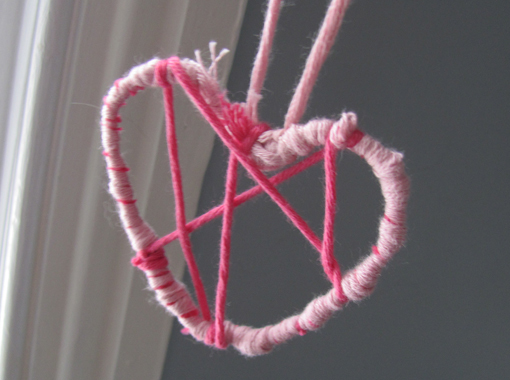 Once the wire hanger is no longer connected, bend it into the shape of a heart. 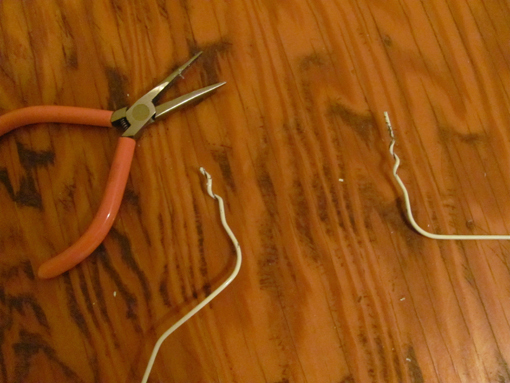 Use your pliers again to twist the ends of the hanger together at the bottom of the heart. For an extra seal, wrap a strip of masking tape around the bonded ends of the hanger. 3. Tie the yarn to the top dent of the heart. 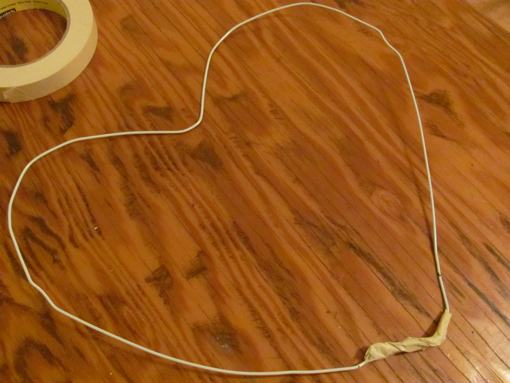 Use another strip of masking tape to keep the knot in place. 4. Start wrapping the yarn tightly around the wire. 5. 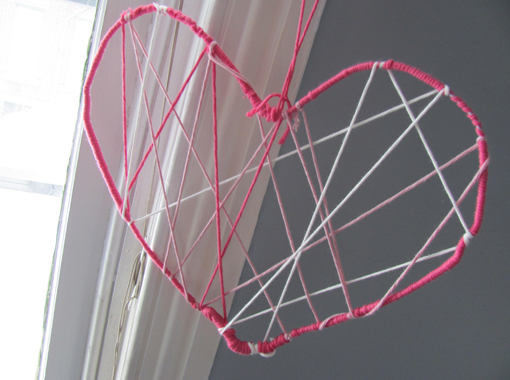 Once you have finished wrapping the yarn around the wire, start to wind the yarn around the sides of the heart for a colorful webbed look (image 1). 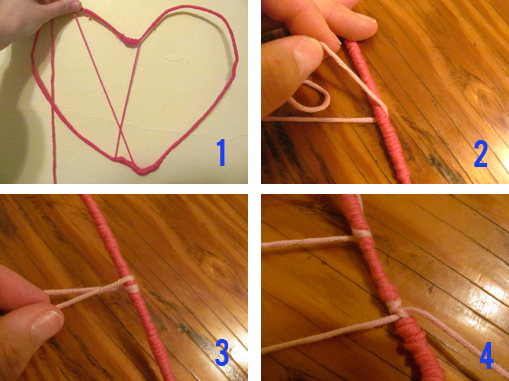 At each anchor point on the web (image 2), wrap the yarn twice around (image 3). 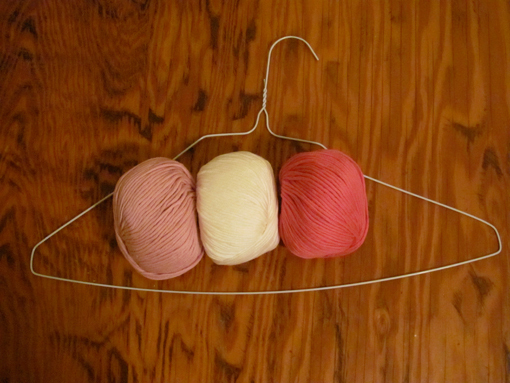 Use different colors of yarn for this part. 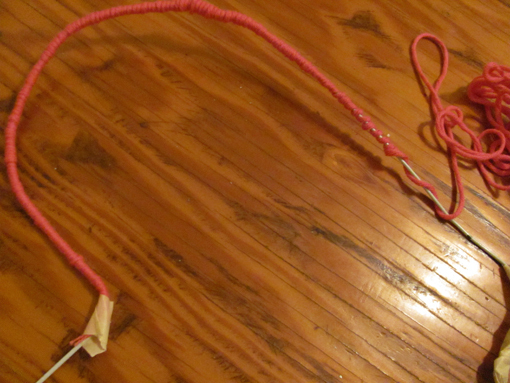 Once you are done with a color, tie a knot around the wire (image 4) and trim the loose end with your scissors. 6. 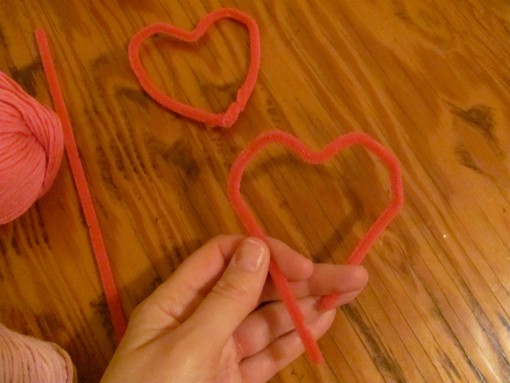 The below photos show the first step for shaping pipe cleaners into small hearts and a finished small heart. You don’t need pliers or gloves for the small hearts. Tutorial by Kate Holeman of The Lettered Set.